Designer and craftsman of NWB Woodworks, a custom woodworking business specializing in free standing, solid wood furniture. I focus my work around original design coupled with time-honored techniques resulting in unique, one-of-a-kind furniture built to last generations. Each piece built in my shop marries visually pleasing lines with superior function. I firmly believe that neither of these two items can exist alone, but must harmonize in order to successfully create a piece of fine furniture. Inspiration for my work stems from all parts of everyday life, including many natural and manmade forms. Many of my designs begin with an inspiration for a single detail on a piece. This detail then evolves through numerous hand sketches and is combined with other design elements into a full-scale drawing and finally into a completed piece. I am well versed in all aspects of the furniture making process from design, engineering, fabrication (stock preparation, joinery, shaping and glue-ups), finishing, delivery and client follow-up. 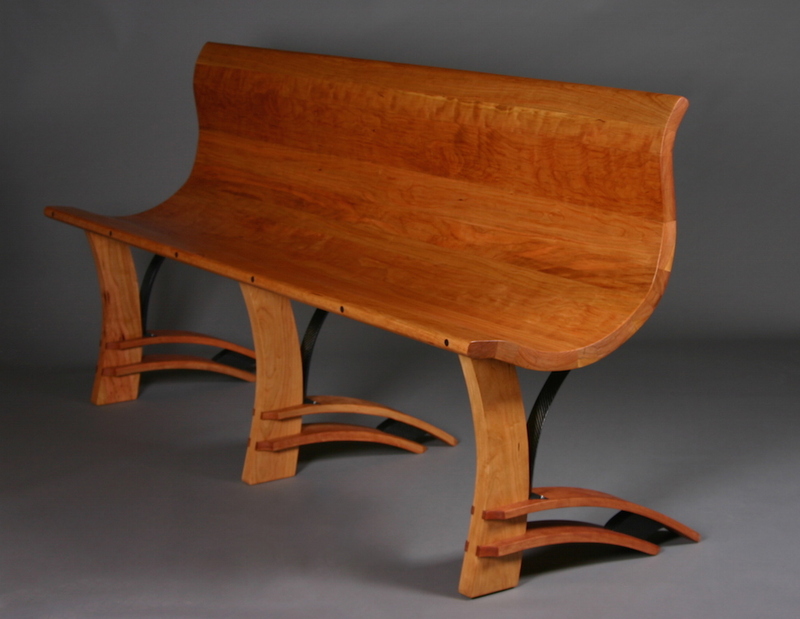 Alumni and Fellows Exhibition; Darwin, sofa table of cherry, ash and tempered glass was chosen to be one of 21 pieces out of 95 entries to be shown fall September 2014-January 2015, in the Messler Gallery at the Center for Furniture Craftsmanship, Rockport, Maine. Maine Wood 2012; DT Breakfast Table of cherry, cocobolo and glass was accepted to be one of 21 pieces shown chosen out of 113 entries from December 2011 — April 2012 hosted by the Center for Furniture Craftsmanship, Rockport, Maine. For our Oak Collections only prime Oak is selected. Using steam we shape the solid wood into strong flowing curves that provide exceptional comfort and support. Each piece is hand built by our craftsmen and has its own number and maker’s mark. It is rare to see Marine Grade Stainless Steel used for furniture design. Rarer still to see it in the elegant tapered section designed to give the Bowline Collection its unique visual quality. Consideration for the environment was one of our original concerns, as we are unwilling to use resources, which are not regenerated at a sufficient rate to halt the erosion of the world’s rainforests. However, we remain determined not to compromise on the quality and durability of our output. Our first choice of material was therefore selected oak from between 100 and 150 years old: strong, resilient, with a transparent supply chain of timber from regenerated forests close to home. Oak also has another advantage, which is that it is simply the craftsman’s favourite resource. An important feature of the Oak is it’s exquisite patterned grain that gives the furniture its unique character. When a piece is finished it is exposed to ammonia, a process known as ‘fuming’, which darkens the oak as well as reduces the maintenance of it and it develops the beautiful silver colour the oak becomes. We select only the finest materials and use the best of traditional craft methods and modern technology. In 1992 Christian Gaze and Simon Burvill founded Gaze Burvill with the aim of creating the finest outdoor furniture, which did not have a damaging impact on the environment. Christian and Simon both trained with John Makepeace’s Parnham Trust in Dorset, Christian at the School for Craftsmen in Wood, and Simon at Hooke Park College. Gaze Burvill originally began in a tiny workshop in England just outside the Hampshire village of East Tisted moving to larger premises in Newtonwood in 1996. Having outgrown the Newtonwood premises Gaze Burvill have just moved this year to Lodge Farm, a purpose-built, eco-friendly farm conversion close by. Care of Furniture: Simple instructions for the care of Gaze Burvill Oak and Stainless Steel Collections are supplied with the furniture. : Fitted cushions are available to order however, the seats are perfectly comfortable without them. They just give a softer and more inviting look to our furniture. Cushions are made of Sunbrella® fabric, and come in Canvas (off-white) as standard, although other colours are available on request. 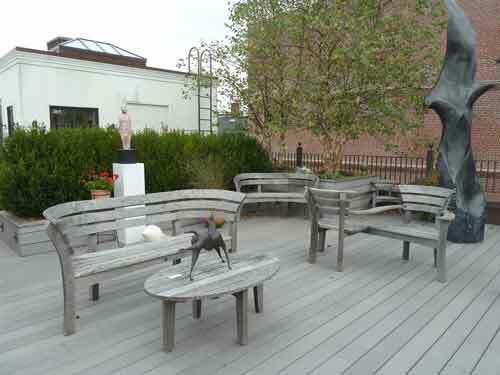 Cushions should be stored away from the elements when not in use. As a designer craftsman I see furniture making as an opportunity to explore the union of function and art. I want to create furniture that is a joy to live with, will last for many generations and grow in value. 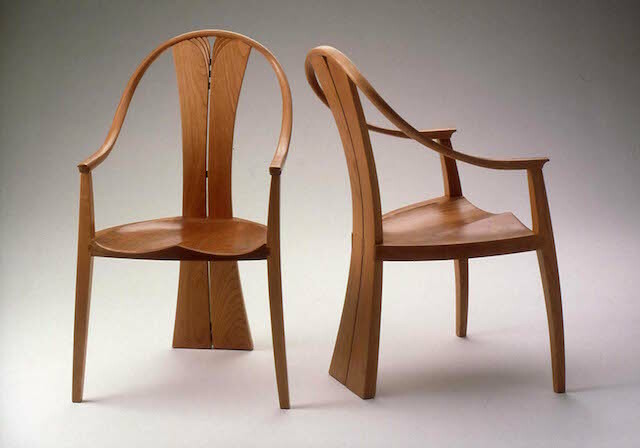 I draw my inspiration from nature as well as other woodworkers, architects and period styles. I see furniture as an expression of our relationship to the natural world in the context of our home environment. My career in woodworking began in 1983 in Roseburg, Oregon, where I apprenticed in a small cabinet shop for three years. In 1987 I opened my own woodworking shop in Vermont. Over the years my work has progressed into studio furniture making, which has always been my dream. In addition to running a full time furniture studio in Windsor, Vermont. I am also a woodworking instructor at Dartmouth College's Hopkins Center.